Medium foiled chocolate bar moulded with "Celebration" in choice of foil colours. Medium foiled chocolate bar moulded with "Christening" in choice of foil colours - pack of 50. Medium foiled chocolate bar moulded with "Thank You" in choice of foil colours - pack of 50. Medium foiled chocolate bar moulded with "Thank You" in choice of foil colours. 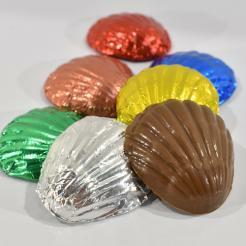 Foiled chocolate seashells foiled in choice of foil colours - pack of 50. Small foiled chocolate bar moulded with "Celebration" in choice of foil colours - pack of 50. Small foiled chocolate bar moulded with "Celebration" in choice of foil colours. Chocolate gold coin stamped with Teddy Bear design. Foiled chocolate teddy bear faces foiled in choice of foil colours - pack of 50. Foiled small chocolate butterflies foiled in choice of foil colours.